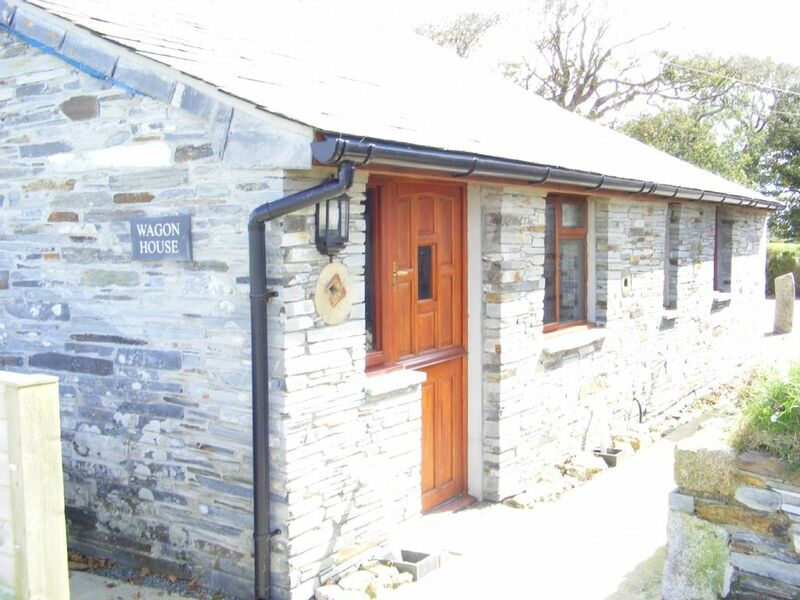 Wagon House is an original stone and slate barn for self-catering, with its own garden. This property has been converted to a high standard of 4 star award. It is on working family farm where there is sheep and cattle in the fields nearby. Also adjacent to the North Cornish coastal path. With excellent pubs and restaurants only a few miles away. The property has easy access into the well fitted kitchen including fridge/freezer, washing machine and microwave, leading into the dining room, which also has a sofa for comfort and TV/DVD/freeview. The dining doors open onto a slate patio with garden furniture and a fenced garden ideal for children. On the ground floor is the master bedroom with en suite, a twin bedded room and the family bathroom with bath and shower. Upstairs is the living room and third bedroom and en suite. Electric, heating, bedlinen and towels are included in the price. Guests are requested not to smoke inside the property. Pets considered. Car park. Our 4 holiday cottages are all converted farm buildings, built from traditional stone and slate. They all vary in size and all receive Visit Britain 4* grading. Each property have their own garden with patio and garden furniture. Parking on site. Wagon House is our largest property which has 3 bedrooms. Master bedroom has a king size bed with an en suite shower room on the ground floor. A twin bedded room and a family bathroom are also on the ground floor. Third bedroom with en suite and living room are up stairs. Entrance open into the kitchen which has a modern shaker kitchen with washing machine and dishwasher. Inter-grated fridge/freezer, electric over and ceramic hob. There is a utility sink as well as the kitchen sink. Well equipped for all your needs. HENDRA BARN which has 2 en suite bedrooms. The double bedroom en suite has bath with shower over. The twin bedroom has en suite with shower enclosure. A lovely open plan kitchen/dining and living area which has a wood burner. Sleeps 4 - please note we can add an extra guest bed or t/cot for small child/infant. This is placed in the double bedroom. COBBLE COURT has 2 bedrooms. The second bedroom has sloping ceilings and will accommodate 1 adult or 2 children. There is 2 single beds, one slides under the other for storage. The main bedroom is a generous size with a king size bed and is on the ground floor. Shower room also on ground floor. WHEEL LODGE has 1 double bedroom. This is our smallest property. Shower room with shower enclosure with mira shower and grab rail, basin with easy tap and a toilet. Radiator. Well equipped kitchen includes electric double, grill in small oven with ceramic hob and extractor fan above, fridge with small freezer box, washing machine, microwave and sink with mixer tap. Open plan kitchen/dining and living area. Wagon House access - entrance door, patio door to garden, kitchen, dining room, master bedroom, twin bedroom and family bath room which also has an enclosed shower are all on the ground floor without steps. the only rooms up stairs are the third bedroom and living room. There is a sofa and tv in the dining room. Beautiful property with a lovely garden which has a slate patio, wooden benches and a slate and granite garden table. Enjoy your evenings watching the stars as there is no street lighting or just look across the fields, which often have sheep and lambs happily grazing nearby. There is everything you will need for a home from home holiday with a well equipped kitchen. Wagon House has bedroom and living facilities on ground level without any steps apart from stepping into bath or shower. Sofa and television in dining room also. Really enjoyed our stay here. Equipped is an under statement for the cottage it had everything we needed and more. It is well situated for mooching about the area visiting Cornwall's attractions. We had our dog with us and the enclosed large garden was perfect and the coastal path just a short walk away. We rarely go to the same place twice but we may well return here as we still have a lot of places to see. And a cake on arrival for us......perfect. Friendly welcome, home-made cake, Stella the dog, well equipped cottage and all of this close to the breathtakingingly beautiful coast. Thank you Angela and co. Thank you for your review we were pleased to welcome you all and would be happy to accommodate you again. We had a lovely week in Wagon House, which is cosy and very well equipped. Everything we could have needed was supplied, and we were greeted with a delicious home-made cake on our arrival. The only thing we would have changed is the weather! Thank you. We had a lovely stay with our dogs. Lovely location for visiting the area. Would recommend and definitely stay again. Thank you for taking the time to write a review for us. It is much appreciated. So pleased you enjoyed your stay and also our lovely part of Cornwall. A beautiful character cottage in the heart of the Cornish country sideVery comfortable with all mod cons. A very friendly atmosphere,a beautiful Christmas tree,card and chocolates welcomed us on our arrival for the Christmas holiday.Port Issac is only a couple of miles away and a visit here is a must. This cottage is highly recommended. Thank you for the lovely cake and milk !! so worth while and I enjoy every minute of work to accommodate our guests. The unspoilt fishing village of Port Isaac and the little beach at Port Gaverne are around 5 minutes by car or can be walked. There are many individual shops and great places to eat. Also be sure to see the small streets of Port Isaac hidden behind the main street. King Arthurs legend is all around the area and Tintagel castle is a fascinating place to visit. The Great Hall at Tintagel house the most amazing stained glass and is often unknown. Boscastle is a picturesque village with the harbour and walk along the cliff path. The are also several circular walks and narrow streets to stroll around. Wadebridge is a small town busy with individual shops and many places to eat and drink. This is also a popular starting point for the Camel Trail. Hire a bike for the day and cycle to Padstow or towards Bodmin. The trail is 17 miles, trafic free and extends from Poley's Bridge, Wenford to Padstow. The Bodmin & Wenford Railway travels to Bodmin Parkway where you are able to walk to Respryn and Lanhydrock House, a lovely National Trust property with gardens and woodland walks. Padstow has many shops, bakeries, pubs and restaurants. From the harbour you can take boat trip for fishing or pleasure. Deposit to be arranged when booking. Dogs may be accepted on request and a charge will be made.